The Skinny-Fat Physique is a term I use to describe a body that looks skinny with a shirt on and fat with the shirt off. Although skinny-fat people have a low-to-moderate body fat percentage, they still look soft and out of shape because they have very little muscle mass. They tend to accumulate fat easily around the waist but very little on their legs and arms. Also, they usually have a hip dominant bone structure: relatively narrow shoulders and rib cage and wider waist and hips. Many people starting from this point are discouraged because they think their genetics work against them and they can never have the proportions to look great. That’s not true. Look at Ryan Gosling as an example. He clearly has wide waist and hips due to his bone structure, and a tendency to store fat on his belly. But that didn’t stop him from building a great physique, and being considered one of the most attractive men alive. Another great example is Omar Isuf. He is now one of the most popular and respected fitness YouTubers but he started from a skinny-fat physique. So while you may have what would be considered “bad genetics” you definitely can build a very attractive and strong physique. Once you develop your shoulders, arms, back and chest and get your waist smaller, you will look like a Hollywood actor. Let’s be precise and talk numbers. What you have to do is reach certain standards of relative strength in a few key exercises. Muscle size corresponds well with relative strength in a medium rep range. So to reach a certain muscle size what you must do is reach the strength level that corresponds to that size. This way your goal is very clear and measurable. To look like Ryan Gosling in that movie all you have to do is reach those relative strength standards. How do you do that? You lift weights and pay attention to your nutrition. Let’s address them one by one. To build muscle and strength you must train with an effective program. I assume you are now a complete beginner. In that case, the routine I recommend you follow in the first 3 months is this. Pause the video to study it. Training is done 3 days per week on non-consecutive days. Example: Monday – Workout A, Wednesday – Workout B, Friday – Workout A, Monday – Workout B, etc. Rest 2 minutes between sets for the compound movements and one minute for the isolation movements. When you hit the required reps for all sets, increase the weight with 5lbs (2.5kg) on all sets the following workout. This will probably cause you to lose 1 or 2 reps in the last 2 sets. That’s normal and the goal for the following workout is to add back the reps in those last sets so you can increase the weight again. Use a lifting app to track your progress. The reason we’re doing mostly low rep training is because we need to use weights that are heavy enough to cause growth. In the beginning you’re far too weak to get a good training stimulus from high rep training as you’d be using very light weights. By doing sets of 5-8 reps you’re getting full muscle fiber recruitment, enough muscle damage, and enough volume per set to cause growth. Gaining muscle and strength has a simple rule: To make the fastest progress possible, you need to match the amount of training you do with your recovery capacity. In the beginning, your muscles grow very fast in response to lifting weights but their recovery capacity is very low. Because of this, in the first few months it’s best to train each muscle group frequently but doing only a handful of sets each time. With this routine you train each muscle group twice a week. By doing that you take advantage of the fact that your muscles adapt rapidly and you’ll be stronger every time you hit the gym. However, each session you only do a small amount of sets to match your work capacity. Things change after a few months because you will adapt and be able to handle more training. So to keep making rapid progress we increase training volume a bit. This routine is designed to bring up the muscle groups that contribute the most to great proportions: your shoulders, upper chest, back, and arms. Your legs get a bit less volume than they could handle but that’s because we don’t want them to grow faster than your upper body. With these routines you can expect to gain 0.5 to 1.5 pounds of muscle per month for the first two years. 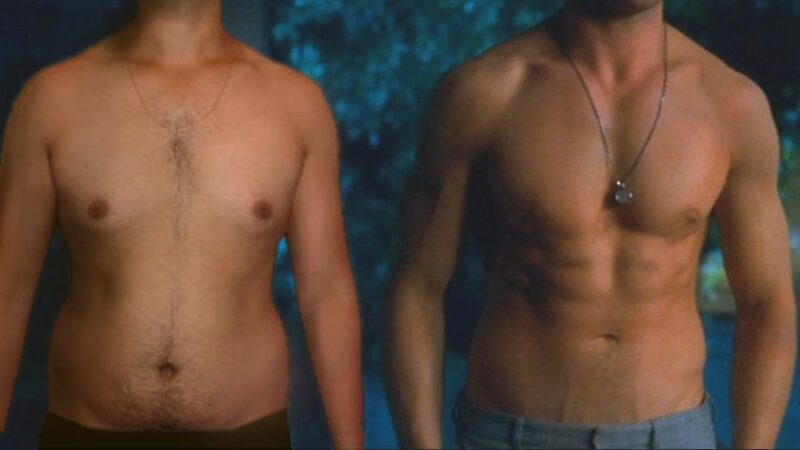 To get a physique like Gosling I’d say you need about two years of lifting. Now, what about nutrition? That’s what we’ll talk about next. Here, we have a dilemma. People starting from the skinny fat physique are equally unhappy with how skinny they are and how fat they are. So they can’t decide which one to pursue first. If they lose fat first they end up being way too skinny, looking unhealthy. If they bulk first they may end up with more belly fat which they hate. I think the best choice depends on your individual situation. If you are mostly skinny but have some fat on your belly, I think you should definitely start gaining weight. Don’t worry about getting a 6 pack right now. Your overall muscle mass is not developed enough to show even through a small layer of body fat. Click on this macro calculator. Input your current bodyweight and select “lean bulk”. At the bottom of the page you’ll see the calories and macros you need to eat every day. If you’re fatter than skinny, it would be best to lose some fat first and only then focus on building muscle and gaining size. The reason for that is because if you bulked now, you would get very fat in a few months. By doing a short cut first you can then lean bulk for half a year while keeping your body fat level relatively low. In the calculator, input your bodyweight and select “normal cut”. At the bottom of the page you’ll see the calories and macros you need to eat every day. To count macros, weight each food you intend to eat. Then input that quantity in the app called MyNetDiary. Your goal is to consistently hit your protein and calorie intake. Start lifting with the beginner routine and follow it for 3 months. – if you’re fatter, cut for 4-6 weeks until your belly is flat. At that point, start lean bulking. After 3 months on the beginner routine, start the intermediate routine. Always focus on getting stronger in the gym. Track your strength progress with a notebook or app. Lean bulk slowly over 6-8 months until your body fat level gets around 15-16% body fat. At that point, switch to cutting until you get back to 10-12%. Then, lean bulk again until you reach 15-16% body fat. During each lean bulk you should be gaining 5-8 pounds of muscle. Repeat this process for 1-2 years, until you’re happy with your muscle development. After the first 6-8 months, at the end of your cutting phase, you should be seeing your abs for the first time. If you want to see exactly what to eat, how to set up your meals, how to go over strength plateaus, how to do cardio, and so on, I recommend the Greek God Program. 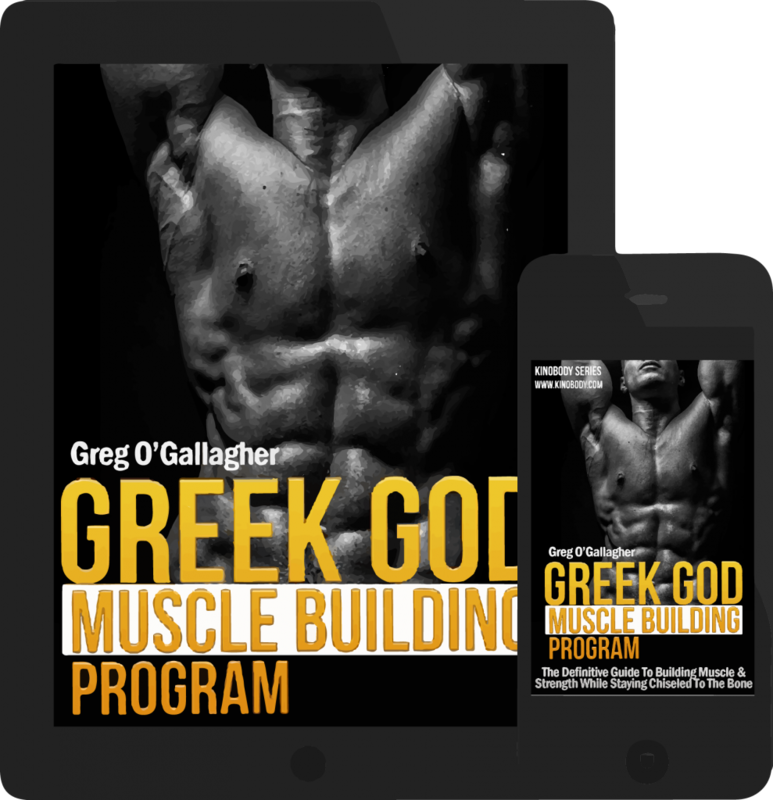 It’s written by my friend Greg O’Gallagher from Kinobody and it’s the program I used to build my physique. Designed to develop the key muscles groups for great proportions, this program will definitely help you get to your goal physique faster. I am currently at around 80kg with 185 cm body height, bodyfat calliper calculations tell me I am at around 20-23% bodyfat. As I do have some more fat on my belly (no abs) I want to cut first before lean bulking. Now I saw your beginner routine and want to start on this routine and got myself a gym membership. My gym does not have a Machine Incline Bench Press, but I really want to build a nice looking chest. My Question to you: Could I switch the Bench Press with Incline Bench Press and add a normal machine chest press (no incline) in the end (as we do not have this kind of machine at the gym I am at) ? When you are a beginer one machine does not make any difference. Radu only explain some training guidelines. Make you diet and your rutin enjoyable! What can I do instead of romanian deadlift ? Hi radu, you do personal coaching? Radu I’m confused about the message from this article compared to the message I got from a different article I read last August titled ‘Why its better to get lean first’, which doesn’t seem to exist anymore. I started these last months leaning down from 18%bf because that’s what you recommeneded, now it seems like from this article you’re saying it might be better to bulk up instead. Has your opinion on the matter changed or what’s up? Thanks I appreciate the help. You need to cut down to around 12% bf then lean bulk to 16% , once you reach 16% cut again and continue the process. In the shredsmart programme in the section about cardio you mention one can do P90X for cardio. My question if I wanted to do that how would I go about doing that in the correct manner. If you follow the P90X training routines you’re expected to train 6-7 times a week, I think 3-4 of those days are resistance training. Basically what I’m asking is how to incorporate P90X as cardio in the shredsmart program if that’s the cardio a person wants to do. I would also like to know the exact incline the bench should be for the incline chest press i.e. How what number hole to insert the pin into. Hope you can reply back soon. 1- You explained that if a person wants to do cardio then he can. You mentioned from amongst the many cardio choices out there that P90X can be a persons choice of cardio. I am fully aware that cardio is not necessary but my question is how does a person correctly incorporate the P90X program whilst following the shredsmart workout routine as they will be in conflict with one another. What I mean is that to follow the P90X training routines a person is expected to train 6-7 times a week and I think 3-4 of those days are resistance training days. If you can please elaborate on how to use the P90X program correctly as cardio for those who have chosen it as their form of cardio. 2. Can you please explain what exactly is the correct incline for the incline bench press. What I mean is which number hole do I insert the pin into for the desired angle choice. 3. I’m 174.5 cm tall, I weigh 57 kg and my waist measurement is 30.7 inches; so according to the way you explained how to estimate body fat percentage I’m around 12-14% body fat. I am very skinny with belly fat now, so I will begin to lean bulk. The problem I know I will face is that in a month or two or even less my waist will measure around 31.5 to 32 inches so around 15-16% body fat. This means I will have to start a cutting phase in less than 2 months, so I won’t be able to reach the 6 months of lean bulking mark due to the fact that I will have to be cutting every 2 months or so. That’s because my waist gains fat/size very quickly. What do you suggest I should do and how I should go about solving this problem if there is actually a solution for it. This is Ammar and i am a very long time follower of your YouTube videos, i want to sign up for the personal coaching by you but i can not find any link to do that or your email address, I hope this comment reaches you as you said you read all the comments in your video and you will get back to me to help me get where i want to get to. Thanks for putting up these articles. I have a tendency to get stuck in “paralysis by analysis” and the way you lay everything out makes it straightforward and I feel like I know what to do. I’m 6’2″ and 5 months ago was 178 pounds with a 33″ waist. Since then I’ve added 30+ pounds to my key lifts and weigh 174.5 with a 32″ waist…. I’m getting close to the Warrior Physique strength standards and a lot of that is this website and your articles. No questions or anything just wanted to say thanks! Thank you! You really are an inspiration. Can you recommend me a proper supplement for the cutting period? You don’t need supplements. Just eat clean and do your workout with purpose with 100% and sleep good. In 1 year your body will be awesome. btw, Radu, you are a MONSTER ! Hope your new career really took off! You deserve. Why is the after picture a picture of Ryan Gosling? Fake Fake Fake.. This is definitely a scam. That was just the thumbnail. It’s not a before and after picture.